You see the posts on social media, and she is grooving and looking like she’s having a blast and you know she absorbed a tough loss in her recent fight and you tell yourself, damn, Heather Hardy makes it look easy. The art of the comeback, the bounce back, the exhibition of grit and resilience which is part of the skill set, most often, that sets the world class fighter apart from the rest of us. Heather Hardy, I told her, you make the bounce back look easy. “Nothing in life is easy Woods,” the 1-1 MMAer told me. OK, so, for real, how has it been since the Oct. 20 Bellator match against Kristina Williams? Home is where the heart is, it is said, and digging down, doesn’t it really mean home is where the most real version of you, the one with the hidden six pack and stinky socks feet, is embraced? 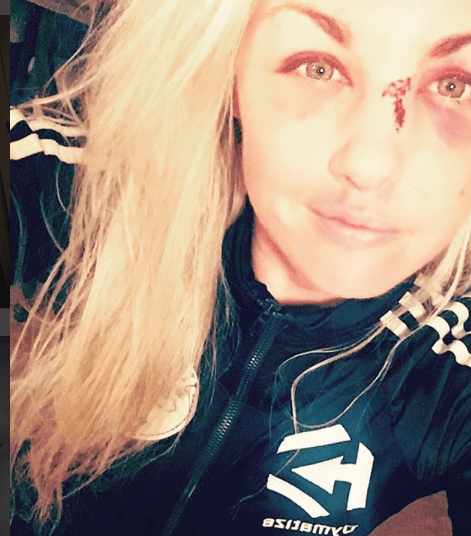 So…Williams did a nose job on Hardy with her round house kick. How has the healing gone? This pic, from two days after the kick heard round the world. So, to reiterate, it hasn’t been easy. She feels pain, physical and emotional. But she soldiers on, grinds it out, with a grin. Fighters, yep, they aren’t like you and me.